Today Autoguide announced that GM is shelving a Cadillac 3-row crossover that was in the works. The new crossover was to be slotted below the Escalade, but the automaker was concerned that it would cannibalize sales from the GMC Acadia and Buick Enclave. They mpe have opted to replace the aging SRX with another 2-row model. I understand that GM wants to move away from the days of excessive badge-engineering but to deny your top tier brand an ability to compete with the other luxury automakers is foolish. The argument that a 3-row Cadillac crossover might hurt Acadia and Enclave sales is bogus, and even if true means poor product positioning on the part of GM. First of all, the Acadia is really more of a direct competitor to the Ford Explorer. An Acadia (2WD V6) starts at 35k with a fully loaded AWD SL2 toping out at 45k. While the Explorer has an entry price of around 30k for a 2WD V6, and a loaded Sport will push 45k. I would argue the Explorer offers a better value, but the point remains the Acadia is not playing in the luxury SUV market. As to the Buick, GM seems to be forgetting that the brand is a tier-2 luxury automaker and is not perceived as "on par" with the European players. You could argue that many people don't perceive Cadillac as "on par" with the Germans either, but GM markets that brand as their luxury alternative. Also worth noting that April CTS sales offer some evidence that if Cadillac really wants to they can poach customers from the default choices. In the US market, the mid-large size crossover segment generates serious profit margins for automakers. Audi already has a popular 3 row SUV, the Q7, with an even bigger one in the works. BMW's X5 has the option of a 3rd row seat (though most people don't know about it) and the automaker is working on a much larger X7. Mercedes has the GL class. Caddy needs a 3-row (non truck based) crossover ASAP. The Escalade is is a great vehicle for what it is, but some people don't want or need that much room. 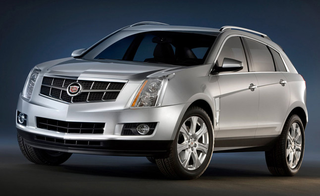 Currently the only vehicle that Cadillac is fielding as a mid-sizer, is the SRX; the brand is well aware that it is outdated and in desperate need of a replacement. The SRX currently has a price range of 39k to about 53k, while the Escalade starts at around 68k. That is a huge price gap and an easy opportunity to offer a premium 3-row crossover with more content and a lower price than Audi, BMW, or Mercedes. I realize that GM's main focus right now is putting out the rapidly spreading recall wildfire, but their recovery is going to hinge upon successful products not just avoiding litigation. They need to take a step back and let Cadillac do what works, that is selling a crap-load of crossovers.